It isn't that I haven't been cooking, I have, but it's been a week of failures. The goats' cheese and gruyere bread from Saveur had a cake-like texture and slightly goaty flavor. I never liked goats' cheese anyway. Those two loaves of bread were the most expensive I've ever made. Then I made a yellow butter cake from Joy Of Baking and that too didn't turn out well. It was heavy and dry and I think it's stupid to not use whole eggs. Since the yellow butter cake left me with all the whites, I decided to make hazelnut pavlovas. Now I've never made a pavlova in my life because I'm not a meringue person. I find them too dry and sweet. Same thing with the other meringue-based overrated confectionary--macarons (I hear protests). The first pavlova I made fell towards the end of the baking time so I cracked new eggs. The second pavlova was stiff and high; yes! Then it happened again. It fell.. I don't know if it's because of the humidity (not likely since I hadn't taken them out of the oven) or the fact that I opened the oven several times, out of curiousity. Anyway, they fell flat and tasted gummy. I gave up. But instead of whites, I now had extra yolks so I decided to make creme brulee because I haven't yet used my blow torch which Ming gave me last Christmas. Ming used the torch to light fireworks and firecrackers during the Chinese New Year period. Wey uses it to toast the unending lines of red fire ants that hurry up and down our backyard fence. Boys. Creme caramel and creme brulee are nearly the same thing, the former is made with eggs and milk and usually baked in a large dish and then turned upside down to reveal the syrupy caramel coating the eggy custard while the later is made with egg yolks and cream and usually served in small ramekins with a crust of caramelized sugar (it's French after all and presentation is as important as taste) on top of a less eggy more creamy pudding. I went through dozens of magazines, cookbooks and websites and the more I searched, the more confused I got. I wanted a creme brulee that's not too firm or too soft, silky and creamy with a good sugar crust. While all recipes I found use the same 4 basic ingredients--egg yolks, cream (some with milk), vanilla and sugar, the amount of egg yolks to cream varied wildly. I was cautious because last year I made Spanish creme catalana based on the Oct 2007 issue of Australian Gourmet Traveller and the creme didn't set. The reason I think was because the creme and eggs were heated in a pot "until thick enough to coat the spoon" but not baked. Somebody should tell them the recipe doesn't work. 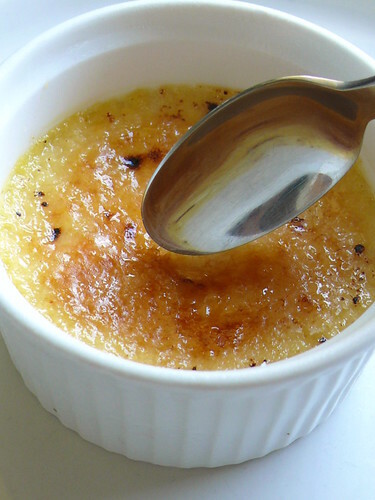 To find out once and for all which creme brulee gives the best texture, I tested three recipes. 1) Saveur & Joe's yolk to creme ratio of 1:125 ml 2) BBC Good Food & Ramsey's yolk to creme ratio of 1: 100 ml (different websites gave different recipes in the name of Ramsey so I used the one with the middle yolk concentration) 3) Nigella & Rimmer's yolk: creme of 1:80 ml. Extremes such as Jamie and Debbie's of 1: 63 and Brown and AGT's thin concentration of 1:158/150 were eliminated. Most recipes call for one tablespoon of sugar to 1 yolk but I reduced the sugar to 3/4 T and it was fine. Eaten with the sugar crust, this dessert was sugar overkill. Which creme brulee did I like best? I was surprised. Both the 1:125 and 1:100 made very soft custard, so soft it was like thick cream. Nigella & Rimmer's 1 yolk to 80 ml cream made the best creme brulee, silky and soft but not runny. I think maybe I was wrong about Jamie & Debbie Puente's recipes, but I ran out of cream. Creme brulee's wow factor is high because you have to break the hardened, caramelized, yummy sugar crust to get to the cream but after eating the whole pot, I felt poisoned with sugar and cream. I think I prefer cream caramel. I hear protests again. 1. Preheat oven at 140 C. Put a tray in the middle rack of the oven and add about 1" /2.5 cm water. Get 6 ramekins ready. 2. Whisk (I used a hand blender whisk) the yolks and sugar until light and fluffy. 3. Bring the cream and vanilla (split the vanilla pod, scrape out the seeds and add the seeds n pod into the cream) to a boil and pour into the yolk mixture, stirring well. Let it sit for a while to let the bubbles subside. 4. Strain the cream mixture into small ramekins. If the ramekins are big, fill halfway up. If small, go up to 3/4 full. This is to make sure you get enough to eat. Carefully place the filled ramekins into the tray of water (if you are making a lot, it's better to place the ramekins on the baking tray on the kitchen counter, fill the ramekins, then put the tray into the oven and fill the tray with hot water) and bake for 30 minutes. The custard should still be wobbly in the middle if you shake the ramekin gently. 5. Remove and let custard cool. Chill in fridge for at least 3-4 hours. When ready to serve, sprinkle caster sugar (1/2 t to 1 t) evenly over the top of the custard (level the sugar), wipe the edges and sides of the ramekin of any sugar and broil under a hot grill or use a blow torch to caramelise the sugar. Chill the custard for 5-10 minutes before serving because the custard can melt under the torch. btw can I also get the same effect of caramelised sugar without the torch? I read somewhere about putting the creme brulee on the very top of the oven. Will it also work? 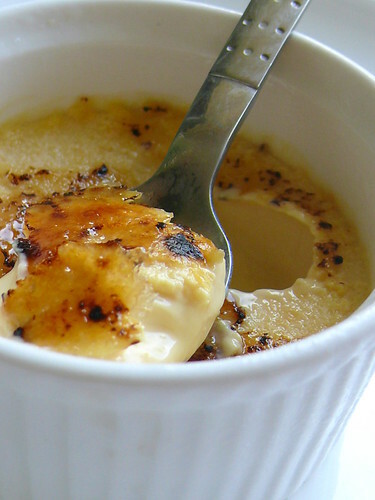 Have been toying with the idea of making creme brulee for ages. I actually like mine without the burnt sugar crust. It's kinda like eating milky-eggy silky smooth tau foo fa. :) And I like creme caramel too. Do you have a good recipe for that as well? Oh Creme Brulee! I like! Was just thinking about making it for a playdate next week. I just think the weather back there is just too humid for meringue and Macaron. But over here, I have no problem getting them light. Wow, THANK YOU for doing all that research! If I ever do creme brulee, I'll come straight to your post. Well mum, the blow torch IS a efficient firework lighter. Btw, you must use the blow torch and the Brulee must be really cold before torching it. That way, you don't have to let it sit for 5-10 minutes cause the heat won't effect the brulee after caramelizing it. pp: oh instant pwder creme brulee sounds terrible! kat: my friend makes the best creme caramel but when i did it using her recipe, it wasn't as good. tt was maybe 8 years ago. i must try it again. lily: i did everything according to the recipes--vinegar, cream of tartar, but it fell. i learnt tt the simplest things are the hardest to make! ming: the creme brulee was chilled overnight so it was cold. i had to fill the gas (it leaked) and light, fill n light about 8 times for each ramekin. it was so frustrating. the strong flame only lasted for seconds. looks good! i applaud your recipe auditioning process too. did you use a broiler or the blow torch? i find the torch gives you complete and utter control. its also a time saver and there is no way you will forget the torch and burn them as you can (me, i confess, i have ... hangs his head) if you put them into the broiler and walk away. also, if the broiler doesn't really get too hot, i find the rest of the dish can get to warm waiting for them to caramelize. i worked in a restaurant once where they did it table-side with the torch, as well as caramelizing irish coffee glasses that way and baked alaska, too. you can make a torch for roughly around 3-4 dollars and takes roughly 10-20 minutes to make. 1. get a long lighter(those weird bbq lighters), a regular lighter (ones you see for smoking purposes usually), tape, and a pen with a metal tip. 3. dissemble your long lighter and from it take out a clear plastic tube, on one end its gonna be attached to the buthane the other the nozzel for the flame. Keep the nozzel on with the tube. I'm impressed with all of the research that you did for this. Thanks for sharing! hi terri, just to drop by to say thank you for the analysis that you did regarding the baove, I'v read it a couple of times and tried to make mine much guided by your research. Thanks! for your meringues it might be because of the temperature you were baking it at. if you do 200 degrees F and leave it in their for long it shouldn't fall. they will be very dry but they won't fall. the humidity will cause them to fall however but shouldn't do it that quickly. Many many many thanks for the recipe! It worked like a charm! I found some recipes on the internet and three of them didn't work. And then I can across your detailed analysis-what a find! Thanks for sharing and best of luck! Your recipe was perfect, it turned out really well the first time i made it. just the right level of silkiness and firmness, and not too sweet. This is a keeper! I have made creme brulee at least 8 times in the past and have not failed after reading your blog. I have tried different cream to yolk ratios but 1:100 or 1:80 is my favorite. You can't lose with your recipe! I find chilling overnight you get the best firmness. Can I know the size of the eggs that you used? Zurin-why not use the whites in a dark chocolate mousse or in a goats cheese souffle? !